Everyone was interested in the crafts on display at the artists open studio day. 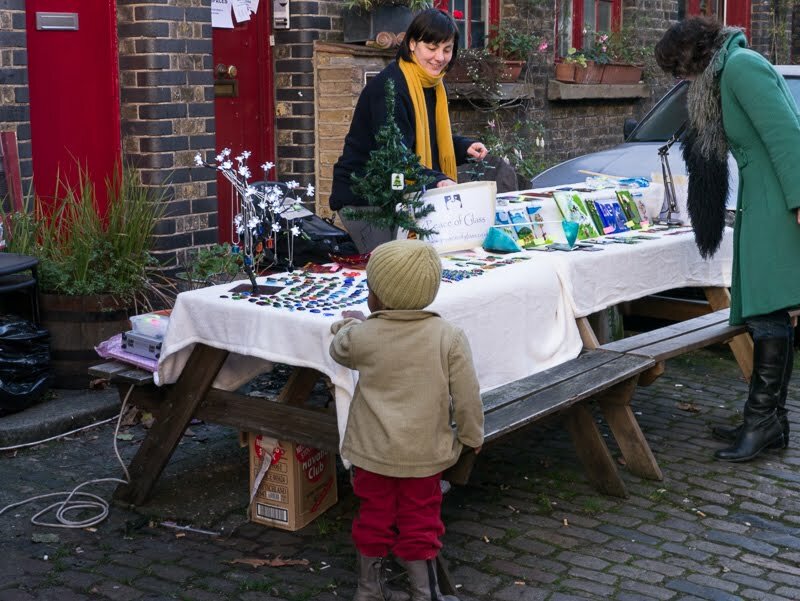 Pullens Yards was purpose built in Victorian times to enable artisans and small traders to live and work there. They were designed with a small flat upstairs and a workshop at ground level. Then you would have found clog makers, brush makers or manufacturers of ships' fans. There was a period of abandonment but they were brought back to life in 1979, continuing with the original intent of providing space for artists. Now you'll find silversmiths, artists, bookbinders and furniture makers. As far as I know, there isn't an equivalent here in Phoenix but, I know when I worked for a short time in San Francisco, there was an old military base that had been converted in to artist studios. It's a great idea. Maybe we will get something like this soon. Those are my favorite types of neighborhoods! A lively arts community adds to the wonder of London. It's lovely someone could pick this up again and preserve that history/tradition. It looks good there Mo and all the better for being revived. I Googled it to find where it was. Sounds like a perfect set-up for an artist! OMG, it sounds amazing. I'd love to see bookbinding. Sounds like my kind of market.